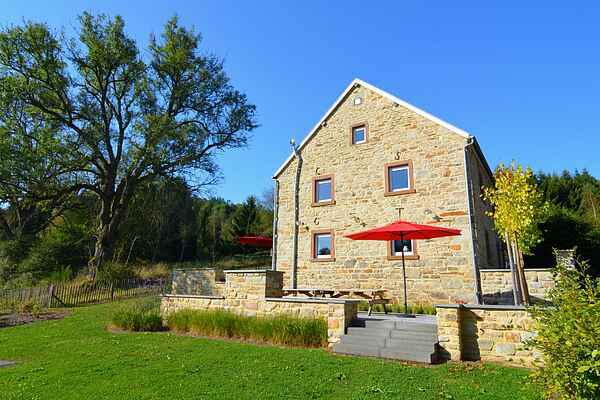 This renovated house, Ondenval, is on a large 4 hectare estate in a valley in Ondenval in Belgium. The house is very quiet in the middle of unspoiled nature, and has beautiful views over the valley. From the terrace you can see across the valley and woods. The house is an ideal starting point for hikes, bike rides or excursions. The home is furnished with a modern and comfortable interior. There is an open kitchen with a large dining table and a cosy sitting area. The bedrooms on the first floor are spacious and there are four bathrooms. Ondenval is a small village in the Ardennes, south of the town of Waimes and on the edge of the Hoge Venen (High Fens). There are two houses on the same property. They also share the same parking space and can be booked together, then you have accommodation available for 24 people.